Senate Majority Leader Mitch McConnell, R-Ky., told NPR in an interview that he continues to support the Mueller Russia investigation — and that nothing in Thursday’s hotly anticipated secret briefing on the Russia probe to congressional leaders changed his mind. McConnell spoke with NPR immediately following a classified intelligence briefing from law enforcement and intelligence officials. The Gang of Eight — a bipartisan group of the four top congressional leaders and the four bipartisan leaders of the House and Senate intelligence committees — met with representatives from the Department of Justice and the FBI to discuss materials regarding a confidential FBI source who met with Trump campaign officials. McConnell has remained the most prominent congressional Republican to defend Mueller and his investigation amid a concerted effort by Trump and conservative supporters to discredit that investigation. The briefing and the intense conservative scrutiny of the FBI comes as lawmakers are leaving Washington for a weeklong Memorial Day recess. Members up for re-election typically use the break to campaign on the legislative successes of the first half of the year. But the Russia investigation threatens to overshadow many of those victories. McConnell touted those successes amid fears that Republicans are at risk of losing their majorities in the House and the Senate. And he would like Trump’s help selling that to voters. Also in the NPR interview, McConnell expressed confidence in Trump’s decision to cancel the North Korea summit. But, he added, he is not going to allow for another open amendment process that produced no discernible results on immigration, like he did in February. “I’m not going to do that again, I can tell you that,” McConnell said. 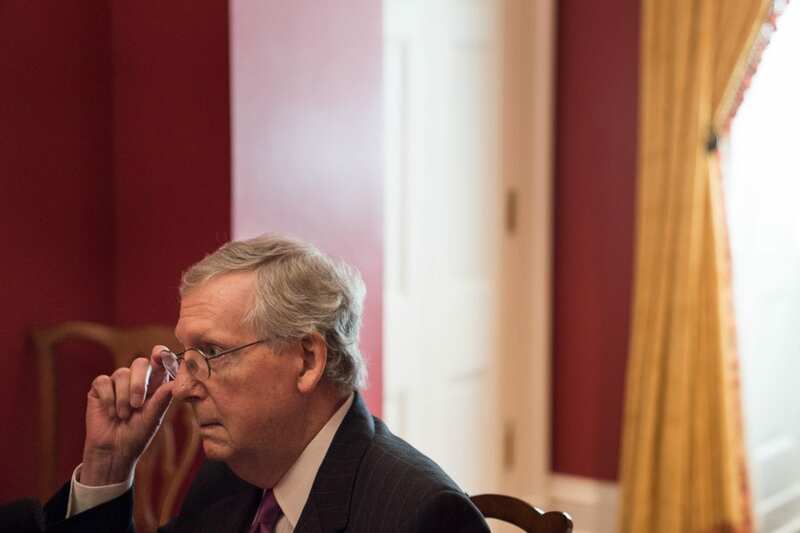 McConnell noted that filling out federal judicial appointments is his top priority and that if a Supreme Court vacancy came up this year, he would act — despite this being an election year. In 2016, McConnell took a very different position, refusing to bring Judge Merrick Garland’s appointment to the Senate floor or even give him a hearing. He said that the new president should decide who is on the Supreme Court. He did not see irony in his stance given his position on Garland because Justice Antonin Scalia died in a presidential election year.